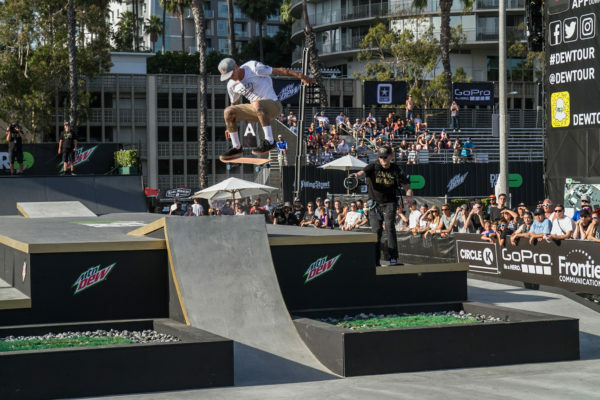 18 of the best skaters in the world were hand-picked to compete in the Dew Tour 2016 Pro Contest on the newly updated course and format July 23-24 in Long Beach, California. Separated into four sections (Tech, Bowl, Rail, Stairs/Gaps), the top six skaters of the group advanced to the Gap section to finish things off in the final round. In the end, Sheckler took the cake with Louie Lopez trailing shortly behind and Ryan Decenzo in third. It was definitely a unique experience seeing certain guys skating out of their comfort zone on certain obstacles. It’s not every day you see Carlos Ribeiro ripping a bowl with Curren Caples. For the full story and tons of coverage from the weekend, visit dewtour.com! Sheckler was showing his strength on all sections of the course, but the bowl section was definitely one of his main forte’s. Ryan Sheckler full cabbing his way into first place.